Wichita City Hall is located at 455 North Main Street, Wichita KS 67202; phone: 316-268-4529. Photo: Roberts House, ca. 1909, 235 North Roosevelt Street, Wichita, KS. Listed on the National Register of Historic Places in 2008. Photographed by User:Jeffrey Beall (own work), 2013, [cc-by-3.0 (creativecommons.org/licenses/by/3.0)], via Wikimedia Commons, accessed March, 2014. The abundance of wildlife and water on the short grass prairie in and around the confluence of the Big and Little Arkansas Rivers attracted hunters and Indian traders to what would become Wichita, Kansas. Soon after the Civil War, Jesse Chisholm (1805-1868), William Greiffenstein (1829-1899), William Mathewson (1830-1916), and James R. Meade (1836-1910) established trading posts in and around Wichita and at the confluence of the Big and Little Arkansas Rivers. Hunting and trading created the financial basis to support a small community. Events moved quickly to clear the way to establish a county and town. In 1865, the State of Kansas created Sedgwick County and in June of 1870, Congress passed an act that authorized the removal of all Native Americans from Kansas, clearing the way for Wichita to be incorporated as a municipality in 1870. The decade of the 1870s was the heyday of Wichita as a cowtown and a period of great growth and prosperity. Wichita was the Kansas headquarters for the Texas cattle trade, shipping more than 350,000 head of cattle out of the city. In 1872, the city welcomed its first railway, the Atchison, Topeka & Santa Fe, and erected a toll bridge over the Arkansas River at Douglas Avenue. Banking, real estate and the cattle trade, and with them meat packing and tanning, became avenues to wealth. The police department was established and in 1878 the city installed gas street lights. The decade of the 1880s was an economic roller coaster ride from boom to bust. The prosperity that characterized the 1870s continued unabated for most of the decade, but, by 1887, the bust that inevitably accompanies a boom occurred. Wealth in the 1880s was made in grain, cattle, but above all else in extravagant real estate speculation. The decade opened with the arrival of Wichita's second railroad, the Frisco, followed three years later by the Missouri Pacific Railroad and in 1887 by the Rock Island Railroad. 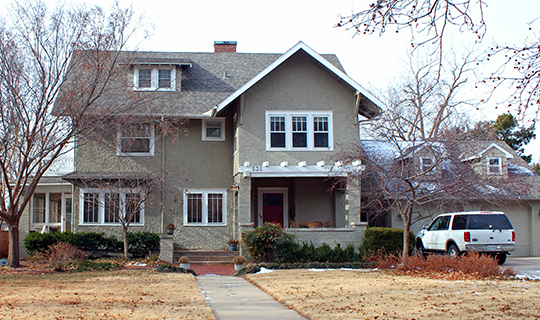 The real estate boom of 1882-1887 was fueled by eastern investment led by the Keene Syndicate of Keene, New Hampshire that purchased commercial land in downtown Wichita at hugely inflated prices and began the development of a middle class residential neighborhood in the curves of the meandering Little Arkansas River, now known as Riverside. Along with the real estate boom came a building boom. During the mid-to-late 1880s, Wichita's major government buildings were erected: in 1885 the Post office and Federal building; in 1888 construction began on the Sedgwick County Courthouse, which, when it was completed, cost $250,000, and in 1890 Wichita's Romanesque Revival city hall. In 1887, Wichita's first major university, Garfield University, now Friends University, was erected. To provide the architectural design work for the building boom, Wichita became a mecca to architects, supporting eight architectural firms by 1887. Prominent among them were the architectural partnerships of Proudfoot & Bird, Gould & Terry and Dumont & Haywood. The decade of the 1890s was a time of retrenchment and recuperation. The economic depression that began in 1887 with the real estate bust continued through much of the decade, reaching a nadir with the national financial panic of 1893. Wichita found itself with far too many buildings and no tenants for them. Many of the grand mansions built in the boom years of the 1880s were abandoned or left in disrepair only to be slowly resuscitated during the late 1890s. Despite the economic hard times, Wichita managed to erect five new school buildings at a cost of $150,000. Wichita's citizens ventured to support the building of the Crawford Grand Opera House and the city of Wichita spent money creating a new park. In 1897 the city, at the urging of L.W. Clapp and Mayor Finlay Ross, purchased one hundred and sixty acres at $100.00 per acre and another parcel of land in 1899 to create the Riverside Park system. The city then spent over three thousand dollars for bridges and walkways throughout the park. The first decade of the twentieth century saw Wichita's economy prosper at a healthy pace. The vacant buildings were filled and new buildings erected. New businesses that would have a lasting impact on the city's future were established. A. A. Hyde expanded the Yucca Soap Company and then changed to manufacturing a salve called "Mentholatum," and in 1901 W. C. Coleman arrived with his Hydro Carbon Company which would become the Coleman Lamp and Stove Company. The Cudahy Packing Company opened a plant in the city and the Dold Packing Company recovered from a devastating fire to rebuild and become a leader in the meat packing industry. During the first decade of the twentieth century Wichita's broomcorn industry began its march to become the national leader in the broomcorn market. Dr. Pamela D. Kingsbury, Historic Preservation Consulting, Wichita Historic Warehouse and Jobbers District (aka Old Town), Sedgwick County, Kansas, nomination document, 2003, National Park Service, National Register of Historic Places, Washington, D.C.